We conducted an observational study within a cardiology tertiary centre with the aim of increasing the primary prevention implantable cardioverter defibrillator (ICD) implantation rate in line with Heart Rhythm UK (HRUK) national target. A total of 326 patients experienced ST-elevation myocardial infarction (STEMI) over a 14-month time period and were offered incidence screening for implantation of a primary prevention ICD at six weeks according to National Institute for Health and Clinical Excellence (NICE) guidelines (TA095). There were 273 (84%) patients who completed the screening process; 26 (8%) had an ejection fraction (EF) of <35%. Two patients had an EF of <30% with a QRS duration >120 msec. Two of 22 subjects had evidence of non-sustained ventricular tachycardia on 24-hour Holter monitoring; one had a positive ventricular tachycardia stimulation test. Overall, three patients received an ICD (0.9%). In conclusion, this process was labour intensive and had a lower than expected yield. The implantable cardioverter defibrillator (ICD) implant rate within the UK remains significantly lower than that across Europe; furthermore, there is marked inequity in access to ICD implant between regions within the UK.1 The need for an ICD is self-evident in secondary prevention patients successfully resuscitated from ventricular tachycardia (VT) or ventricular fibrillation (VF). Intuitively, therefore, it would seem most likely that underperformance and inequity of access in the UK resides chiefly within the primary prevention patient group. A number of international randomised-controlled trials have identified patient subgroups at an increased risk of arrhythmic death for whom implantation of a primary prevention ICD carries a prognostic benefit.2-5 On the basis of these, the National Institute for Health and Clinical Excellence (NICE) has made recommendations on patient groups for whom ICD implantation should routinely be considered on prognostic grounds.6 Appendix-C of the NICE guidance document makes recommendations for audit to determine whether clinicians are in compliance with NICE guidance. In this paper we report the yield from incidence screening on a cohort of patients at six weeks following ST-elevation myocardial infarction (STEMI). Nottingham University Hospitals NHS Trust introduced an incidence screening programme for implantation of primary prevention ICDs following STEMI in January 2009. The secondary care cardiology population served by the Trust at this time was around 600,000. Prospective analysis of Myocardial Ischaemia National Audit Project (MINAP) data identified 326 patients aged 80 years or less over the 14-month period December 2008 to January 2010, inclusive. Patients over the age of 80 years were excluded from the systematic screening programme because they were outside the evidence base for primary prevention ICD implantation. Left ventricular ejection fraction (LVEF) was assessed at six to eight weeks post-discharge using the Simpson’s biplane method. Subjects with an ejection fraction of less than either 35% or 30% were considered for implantation of a primary prevention ICD according to either Multicenter Automatic Defibrillator Implantation Trial (MADIT) or modified MADIT-II criteria as outlined in NICE TA095.6 The primary outcome measure was the number of subjects identified for implantation of a primary prevention ICD. This study was registered and approved as a hospital audit. Table 1 shows the demographics of subjects screened for ICD implantation. Figure 1 shows their outcome as they progressed through the screening process. A total of 273/326 (83.7%) completed the screening process. Of those who did not complete screening: 12 declined investigation, 10 moved out of area, six were lost to follow-up and 25 died (22 patients died from cardiac causes during their index hospital admission; the remaining three died following discharge of non-cardiac causes). Primary angioplasty (1-PCI) was in the process of roll-out in the centre at the time of this study. Of the surviving patients, 16 (5%) underwent no revascularisation, 157 (52%) received 1-PCI and 129 (43%) thrombolysis. Twenty-six (8%) subjects had an ejection fraction of 35% or less; two of these qualified for an ICD on the basis of modified MADIT-II criteria of an ejection fraction of <30% with electrocardiogram (ECG) QRS interval prolongation. Only two of the 22 subjects proceeding onto 24-hour Holter recording had evidence of non-sustained VT (NSVT); one of these had a positive VT stimulation test and ICD according to MADIT criteria. Overall, only three of 326 subjects received an ICD – a yield of 0.9%. This gives a local incidence-based primary prevention implant rate for our population of 4.3 devices per million per year. On the basis of the results of this study, incidence screening at six weeks following STEMI would not appear to be an effective strategy for the identification of subjects suitable for primary prevention ICD implantation – it had a low diagnostic yield and involved a significant amount of clinical and administrative work to perform. This was a concerning finding because audit of clinical activity according to the criteria used for this study are specifically highlighted in Appendix-C of NICE guidance TA095 as a tool for measuring compliance with NICE guidelines. We are congratulated because we are compliant with NICE guidelines; but the screening activity itself just does not translate into a meaningful number of implanted devices. How could this paradox arise? We feel that the answer readily comes from a divergence between the inclusion criteria of the MADIT studies and the actual clinical characteristics of the patients included. Specifically, in MADIT and MADIT-II, patients were eligible for inclusion if they had experienced a significant myocardial infarction at least three weeks and three months, respectively, beforehand. However, 77% of patients in MADIT and 88% of patients in MADIT-II were greater than six months remote from their most recent myocardial infarction. We know that adverse remodelling can be a gradual process that occurs over the months and years following myocardial infarction. It is, therefore, unsurprising that incidence screening following the index myocardial infarction translated into relatively few primary prevention ICD implants. Under such circumstances, it could be argued that resources might better be directed towards prevalence screening within patients with established heart failure. Furthermore, the adoption of an ejection fraction only based approach to eligibility criteria – as advocated by current European Society of Cardiology (ESC)/American College of Cardiology (ACC)/American Heart Association (AHA) guidelines7,8 – would probably enhance pick-up considerably by simplifying the screening process. Scott et al. performed a retrospective audit of 546 patients following admission with myocardial infarction.9 Making a variety of assumptions, they arrive at an estimate for primary prevention ICD implantation requirements in a broadly similar population to our own of 29–39 per million per year. We observed an actual implantation rate markedly lower than this at around 4.3 per million per year. Generally, our population had better ejection fractions than described in their study and their assumptions regarding the frequency of NSVT were greater than we observed. Nevertheless, we think there is one area of important agreement between the studies – if you concentrate on ejection fraction and QRS duration alone, you will pick up most of the potential implants with minimal effort (in our case two out of three). The actual new ICD device implant rate for the year 2009 across the East Midlands was 74 per million per year.1 Introduction of the scheme described here would have a marginal effect on raising this figure by around 4.3 towards a national target at that time of 100.
might be expected to reduce even further. EB, HP, MD, AJA and ADS have received financial support from the device companies to attend educational meetings/conferences. We did a very similar study 2009-10 in Newcastle upon Tyne at a secondary CCU. We found only one patient out of 200 or so (not excluding >80yr olds) who had failed to be screened adequately, taking into account co-morbidity. This was despite our not agreeing as a unit to institute a policy of screening, but this being based on individual doctor’s good practice. The improved treatment of acute MI has probably reduced the number below what was previously expected, among other factors. I think it raises questions about the high rate of implantation in Europe (similar to pacemakers?). 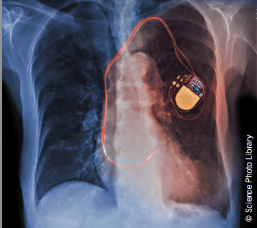 It seems odd that if the UK is failing to implant enough pacemakers, that we are about the same as Norway and Holland.